City Librarian, Margaret Hayes’ Project Up-date to the Arts, Culture, Recreation and Community Strategic Policy Committee Monday 12th September 2016. The commitment of DCC to providing a city library in the North West Quadrant of Dublin 1 has been longstanding. It was a pillar of the Library Development Plan 2012-2016 which council adopted in 2012. The project, announced in April 2013, is being financed by Parnell Square Foundation and carried out by its wholly owned development company PSQ Developments Limited with the support of Dublin City Council, Kennedy Wilson and the Office of Public Works. At its heart this project is infused with an overall vision which is about transformation not just of the physical or built environment but also for the people of Dublin. This transformation will be made possible by the re-use of beautiful Georgian Houses and the design and construction of magnificent new public spaces. It will also be achieved for individuals and communities through access to the world of ideas, information and imagination and opportunities to Learn Create and Participate. A Digital library for the 21st century where Dubliners have access to the latest technologies – addressing all literacies, print, media and digital. 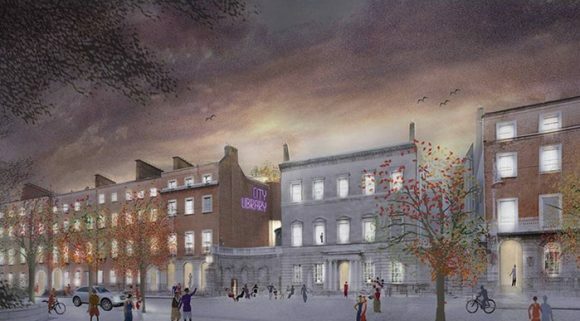 The city’s municipal gallery, Dublin City Gallery The Hugh Lane is a key partner in this project enthusing the project with a strong visual arts presence with synergies in print collections and cultural programming and via shared learning and creative spaces. Insights and expertise of the City Arts team have informed the project brief so too have public consultation and conversations during 2013 and since. The detailed spatial and functional brief was issued in April 2014. The Design team, appointed in July 2014, is led by Grafton Architects and Shaffrey Associates but includes a diverse range of professionals. The brief challenged the design team to make a visitor experience that presents a truly ensemble experience, a menu of opportunity – a visitor experience that connects services visibly, horizontally and vertically, moving between the Georgian houses and the new build spaces and providing points of intersection with Dublin City Gallery The Hugh Lane. They were asked to design a beautiful library, a place that Dubliners would flock to and enjoy, their City Library at Parnell Square. Many challenges – which they have addressed with imagination and understanding. We are delighted to share a selection of the draft sketch design images in the attached gallery.